Please note that the content of this book primarily consists of articles available from Wikipedia or other free sources online. An ethical job is a broad term to describe a job which accords with a person''s ethics or values. 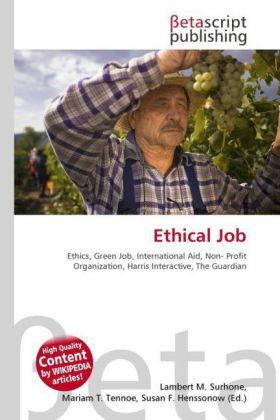 Ethical jobs may include Green jobs, community sector jobs and jobs in the International aid sector. Survey data from various countries shows a trend for jobseekers to seek out ethical jobs: A 2009 survey of Australian Non-profit organizations by EthicalJobs.com.au found that 87 per cent of employers surveyed said that job seekers were more likely to apply for a position seen to be ethical. A 2007 opinion poll by Harris Interactive of 1741 US employees found that 73% of respondents said it was important that your employer be environmentally and socially responsible . A 2005 poll by The Guardian newspaper of 2000 undergraduates in the UK found that "over 70% of students said that a company''s ethical track record is a crucial factor when choosing their employer."